This past January, when the snow was piled high and Idaho’s bird hunting seasons were all but over, I had the good fortune of traveling to Kansas with my older brother, Shawn Wayment, DVM, to pursue pheasants and bobwhite quail. As far as the hunting season goes, it was like rolling back the clock to sweet October with temperatures in the 60’s and 70’s. While the birds were scarcer and warier because it was the last week of the season, the dogs found birds each day and we got some shooting in. As far as the scenery goes, it was like stepping back in time to a different era. For three days, we hunted in wide open country dotted with abandoned homesteads. Most of these homesteads had old picturesque windmills and many hosted their own coveys of bobwhites, the object of our pursuit. Our host for the first two days, Casey Mader, let us know succinctly where his loyalties lay: “Coveys are for countin’ and pheasants are for killin’.” By this, he meant that coveys of quail were only to be shot into if there were more than eight birds. 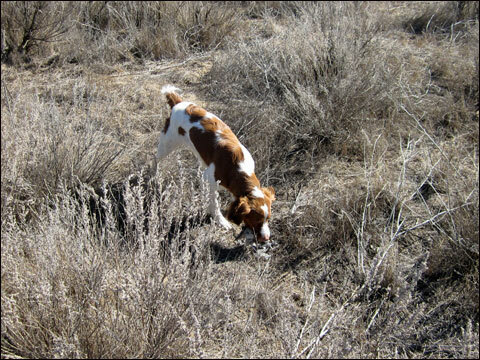 Casey’s goal was to make sure that each covey had plenty to keep the quail population healthy for the season to come. The sheer number of birds that we saw­ (ten coveys in two days) was a testament to the fact that his vigilance works. The author holds a beautiful hen bobwhite. On the first day of the hunt, we located three coveys, one of which was a “fifty birder,” as accurately predicted by Casey before we located them. While we had a few points and Casey took two quail, we could not locate one single bird of the fifty after the initial flush because of the warm and dry scenting conditions for the dogs. Still it was fun to see so many birds. Nor will I soon forget walking through thick tamarisk brush (which is a small, noxious tree sometimes called Salt Cedar not native to Kansas or the United States) along a completely dry river bed and unexpectedly stepping into a large covey and having them buzzing around me and over my head like a swarm of angry bees. Of course, in all that chaos, I missed the shots. Although Shawn and I came up birdless on day one, we enjoyed the warmth, the birds, and the unique uplands of southwestern Kansas. The following morning, we traveled 30 miles northeast to a community where we had permission to hunt a huge cattle ranch. The country was primarily farm and ranch country interspersed with rolling hills covered with sand sage. For this Idahoan, the scenery was not too different from our high plains desert with sage brush sans panoramas of looming mountains in the distance. 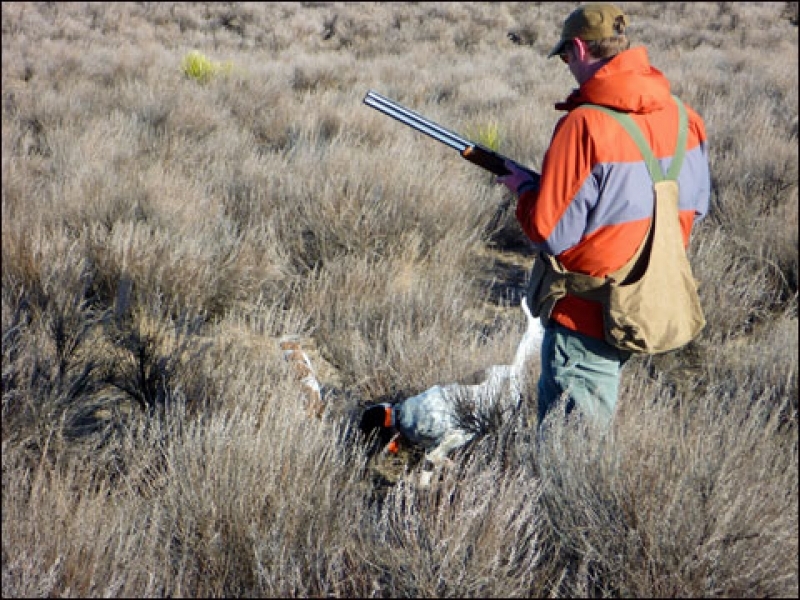 Still, the landscape is wide, open country and not what one expects for southern bobwhites after reading the classic literature on this special game bird. But don’t let the cover fool you, the birds are there in abundance. It’s funny how places that many consider as boring, drab, or ugly actually take on a certain appeal—and even beauty― to the bird hunter who knows there are birds to be found. Such is the rimrock country for the chukar hunter and the high-desert sagebrush plains for the sage grouse hunter. And such is southwestern Kansas for the quail hunter. After a short hunt in which we saw a few quail with no shooting, we drove a short distance to our next destination. As we approached, I observed a large flock of mourning doves (which had been absent from icy Idaho for over four months) off the side of the road and pointed them out to Shawn and Casey. Interestingly, Casey shared a tip that, in my limited experience, turned out to be accurate: “Where there’s doves, there’s quail.” I guess that should not be surprising as doves have always been a good sign since the beginning of time. Fortunately for us, Casey planned to have us hunt right close to where we observed the doves, which was on the outskirts of a large field with a circular irrigation pivot that was surrounded by more cover than one would expect along its edges and corners. Surprisingly, we found two or three coveys around this one field. The author walks in on a point by Gretchen and Sunny on the edge of a field irrigated by a pivot. Shawn’s dogs, Gretchen and Geppetto, which are both veteran bobwhite hunters, both showed my Brittanys, Sunny and Misty, how it’s done. Sunny girl picked up on the game quick and had two beautiful backs to Gep’s points. Walking in on the first point, I was all nerves and consequently missed the shot. However, on the second point by Gep and Sunny, Shawn and I both shot at the retreating rocket and missed, but I connected on my second shot winging the bird. We promptly directed the dogs to where the quail had fallen and Misty, the Brittany puppy, located the running bird and made a nice retrieve. All the hunters and the dogs were in on the action and in good spirits. Later on, while hunting some rolling sand sage hills with Shawn and Casey, I headed back toward the vehicle to water my dogs because of the heat. Afterwards, I hunted a new area across the two-track road and noticed a little divot in the landscape choked with a tumbleweed called “thistle” by the locals. Casey mentioned earlier how much the birds loved this weed both for protection and for food. Based upon my limited knowledge, the place sure looked appealing. Once in the weeds, I immediately began to notice quail sign: Droppings, feathers and tracks, which caused the heart to race with excitement. Misty, a Brittany puppy, makes her first retrieve of a bobwhite. The young Brittany pup, Misty, quickly got birdy and gave me enough notice to get ready. A huge covey of thirty-plus birds flushed in unison from the edge of the thistle patch and I dropped one with the bottom barrel and missed with the top barrel. The older French Brittany, Sunny, retrieved the bird to hand. Although Misty did not point, I was so proud of her for finding the birds. Back at the truck, the temperature showed an unbelievable 77 degrees, which is really too hot for good scenting conditions. Notwithstanding the missed opportunity for a double, this experience and the trip, especially in the dead of winter, are things of a bird hunter’s dreams. The following day, Shawn and I hunted in north central Kansas, and although the country and cover was heavenly and we saw a few jumpy pheasants, we did not find the quail as we had the two days before in southwestern Kansas. Notwithstanding, we enjoyed each other’s company and the scenery. That last day, we learned that we were coincidentally hunting in Kansas on its 150-year anniversary. I seriously can think of no better way to celebrate the birthday of the Prairie State than by pursuing its finest, native game bird, Mr. Bob White. I can’t wait to go back. The quail hunting season in Kansas starts on the second Saturday in November and goes through January 31st. An out-of-state hunting license for Kansas is $72.50 and the license covers a calendar year. So if you buy a license in January, it’s good for the following fall. Kansas has a walk-in program for private property and there is more huntable ground than you can imagine. Look for the WIHA signs which designate such properties. For late-season quail, 7 ½ shot is plenty, but for late-season pheasants, don’t use any shot smaller than size 6. There is no finer game bird for a pointing dog than the bobwhite quail, hence the reason he is often referred to as a “gentleman.” On the other hand, the ringneck pheasant is a dirty rotten scoundrel and a hard-charging flusher or retriever is the better breed. 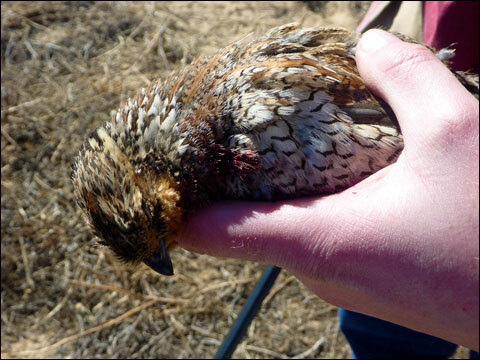 Some of the WIHA’s that we hunted in southwestern Kansas had both bobwhites and scaled quail. The scaled quail often seems more like a running rooster pheasant than his gentlemen cousin, the bobwhite. It probably would not hurt to take some running shoes to chase after those dirty rascals. In all seriousness, scaled quail are a great game bird and offer a little variety in your Kansas hunt. Andrew M. Wayment ("Andy") is an attorney by profession, but an outdoorsmen by passion. He lives in Idaho Falls, Idaho with his wife, Kristin, five (soon to be six) children and two bird dogs, Sunny, a French Brittany, and Misty, a Brittany. Andy not only loves to fish and hunt, but loves to write about these endeavors and has published numerous articles on his adventures. In the very near future, Andy's first book on fly fishing will be published by American Book Publishing. Andy is a regular contributor to the Upland Equations blog found at www.theuplandequation.blogspot.com.